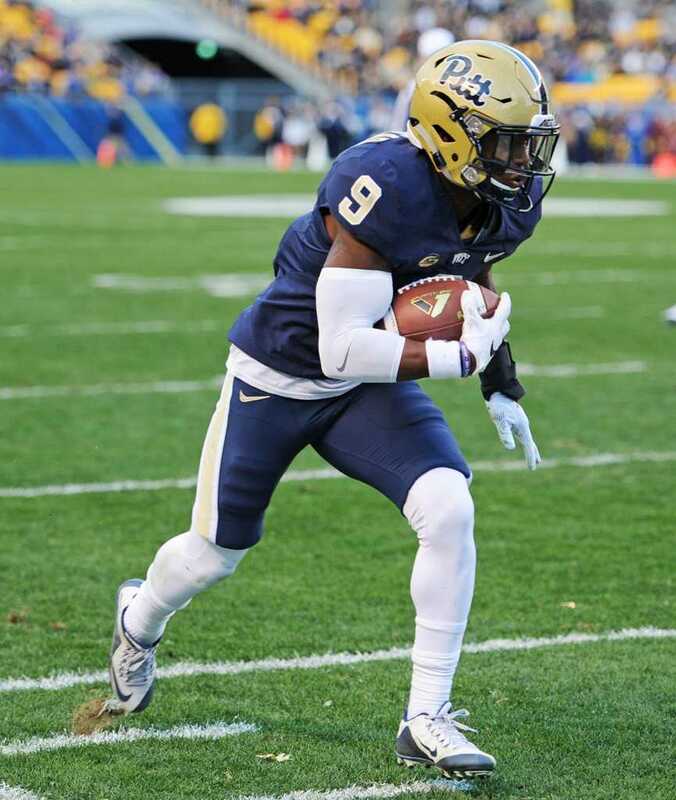 While Pat Narduzzi’s team put together a successful 2015 campaign on the field, a group of football players thrived off the gridiron as well. The ACC announced that five Pitt football players — redshirt junior offensive tackle Adam Bisnowaty, junior wide receiver Dontez Ford, sophomore cornerback Avonte Maddox, junior tight end Scott Orndoff and freshman cornerback Jordan Whitehead — earned ACC All-Academic team status. In order to earn a spot on the ACC All-Academic team, players must have maintained a 3.0 GPA in the previous semester, as well as a 3.0 cumulative GPA in their academic career. The requisite for graduate students is a 3.5 GPA. In total, 56 conference players made the team. Narduzzi also lauded the fact that these players contributed significantly on the field as well, specifically highlighting All-ACC team members Bisnowaty, Whitehead and Maddox. “I think it is even more impressive that three of our All-Academic players also received All-ACC recognition for the 2015 season,” Narduzzi said. This marks the third consecutive appearance on the All-Academic team for Bisnowaty, who already graduated with a degree in communication and is currently pursuing graduate work in health and fitness. The ACC coaches named Bisnowaty to the Coaches’ All-ACC first team this past season. This was Maddox and Orndoff’s second appearance as All-Academic team members. Maddox earned All-ACC honorable mention status this season after intercepting three passes and breaking up 12 while compiling 75 tackles and a blocked field goal. Orndoff finished second on the team in receiving touchdowns with five. Maddox is enrolled in the Kenneth P. Dietrich School of Arts and Sciences, while Orndoff is an administration of justice major. Ford and Whitehead both earned their first All-Academic berths. Ford, a former transfer from Syracuse University, served as Pitt’s No. 2 wide receiver last season, totalling 26 catches for 505 yards and two touchdowns. Ford is a business finance major. Whitehead’s recognition on the team adds to an already-impressive haul of ACC honors for the freshman. Whitehead earned ACC Overall and Defensive Rookie of the Year awards this past season, while both the Football Writers Association of America and the ACC coaches named him to the Coaches’ All-ACC third team. He finished his first season with a Pitt freshman record 109 tackles, while also rushing for two touchdowns on offense. He is currently enrolled in the Dietrich School of Arts and Sciences. Pitt had the third-highest number of players make the ACC All-Academic team with five, trailing only the University of Virginia, which had six players, and Duke University, which had 13.